A news story about the so-called “Gospel of Judas” is starting to receive attention from the media. 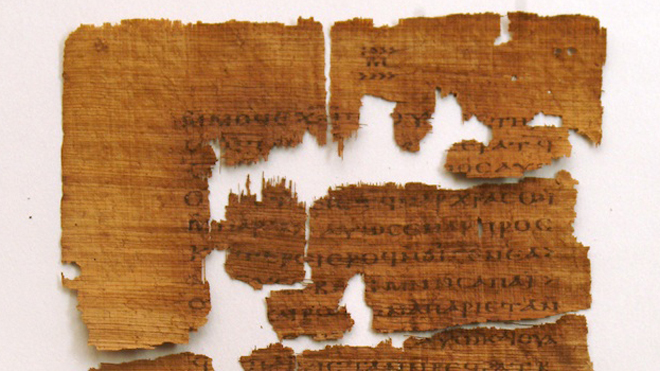 The Gospel of Judas is a fragmented Coptic (Egyptian)-language text that portrays Judas in a far more sympathetic light than did the gospels that made it into the Bible. In this version of the story, Judas turns Jesus over to the authorities for execution upon Jesus’ request, as part of a plan to release his spirit from his body. In the accepted biblical version of the tale, Judas betrays Jesus for 30 pieces of silver. First, the document dates to 280 A.D., which is approximately 250 years after Jesus’ ministry, death, burial and resurrection. Second, the author assumes a great deal about the canonization of the New Testament. There were good reasons why the Gospel of Judas was not accepted as authentic, inspired scripture by the early Christian community. Third, this is not a tale. The Biblical account of Jesus’ ministry is a historical, objective fact. Fourth, Jesus did not die on the cross “as part of a plan to release his spirit from his body.” This seems a bit mystical to me, and consistent with other false, Gnostic “gospels” the media and theological liberals like to trumpet from the rooftops. The New Testament was written by these men who walked with Christ and were taught by Him personally. It was written in their own lifetimes. The copy of this spurious “Gospel of Judas” was written 250 years later and conflicts with contemporary accounts. Not too trustworthy! To place this in a modern context, say I suddenly produced a letter entitled, “The Memoirs of General Fred Hillbilly – Confederate General Extraordinaire.” Suppose in this letter, I claimed that General Robert E. Lee actually didn’t fight at Gettysburg at all – his army was routed while in camp and all his soldiers were asleep. Men were bayoneted in their tents, shot out of hand and all prisoners were hung without trial and tossed into mass, unmarked graves. It was a cold-blooded massacre, and the myth of Picket’s charge on the Union lines was invented to protect the reputation of the Union Army and President Lincoln. This is obviously ridiculous revisioist history, not to be taken seriously by any thinking person. This is precisely what this “Gospel of Judas” is to Christian history. Inspired Scripture will speak to those who are genuinely saved and have the indwelling Holy Spirit (1 Cor 2:6-16). To those who have not been saved by the grace of God, it will be virtually incomprehensible. The whole weight of Scripture testifies to the authenticity of the Biblical account of Jesus’ betrayal at Judas’ hands. Satan was working in Judas’ heart, tempting him to betray Christ (Jn 13:2). Jesus stated one of the disciples would betray Him (Jn 13:21), and identified Judas as the man (Jn 13:26). Judas then fled into the night (Jn 13:27). This account is also given in Mt 26:14-16, Mk 14:10-11 and Lk 22:3-6. A false “gospel” which posits that the purpose of Christ’s death was to “release His spirit from His body” does not gel with the body of faith, or corporate teaching, of the rest of the New Testament. When people think of “choosing the canon of Scripture,” they inevitably conjure up images of men sitting around a conference table, picking which books belong in the New Testament and which one’s don’t. It did not work this way! Those books which had the marks of authenticity, described above, grew in popularity and prominence and were gradually adopted over time by the great majority of the Christian churches in the first three hundred years or so after Christ’s death, burial, resurrection and ascension. In short, by the time lists of “orthodox” books began to circulate, the church fathers were not arbitrarily picking some to keep and some to toss in the trash –they were merely codifying what had already happened in the larger Christian community. There is no reason to take this silly “gospel” seriously. Please force unbelievers and theological liberals to use these same standards of reasoning and apply them to undisputed historical figures – they will see the amazing double standard at work. Would anybody be willing to give “The Memoirs of General Fred Hillbilly – Confederate General Extraordinaire” the time of day? Then don’t give the “Gospel of Judas” the time of day either.